One of the fastest, most powerful low-profile baitcasters ever made, with a drag system that's 2–3 times stronger than other reels in its class. The REVO rests comfortably in your hand, casts like a dream, and turns heads on command, thanks to its oversized main drive gear. Features include rugged X-Cräftic aluminum alloy construction, seven HPCR ball bearings, and both a power handle and an extended throw handle. Weight: 8.7 oz. Max drag: 24 lbs. Line capacity: 12 lbs./175 yds. Line recovery: 28" per handle turn. Gear ratio: 6.4:1. Right-hand retrieve. "Only had time to use reel one time, first trip out caught some small reds in the 20 to 24" size. Matched with the garcia rod and 10# test line it was great fun and I could tell the drag was going to be very smooth. " "This is the second Revo Inshore I have purchased. 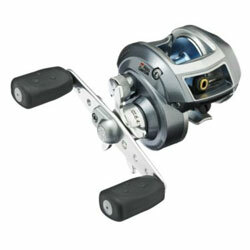 Like the first one this reel is built to handle the big ones and perform in the harsh enviroment of South Louisiana." "I have owned Garica 5600, 6000's and have always been very pleased with them but I wanted a reel to throw a lighter bait. I search reels and reviews for a couple of weeks and looked at them in the store several times before I finally came off the money to try it because all the great reviews."